The National Human Rights Commission (NHRC) celebrated the Human Rights Day here today. The Human Rights Day is celebrated on 10th December every year to commemorate the Universal Declaration of Human Rights (UDHR), which was adopted and proclaimed by the General Assembly of the United Nations in 1948 as the common standard of achievement for mankind. Speaking on the occasion, Chief Justice of India, Shri Justice T. S. Thakur said that whenever we talk about human rights, we talk about the rights inherent in human beings. Recalling the historical development of human rights, he said that the human rights were first time globally recognised in the year 1948. He said that the arena of human rights is never static and always challenging. The Indian Judiciary is well equipped to deal with these challenges, he added. He also said that the Supreme Court has given six months time to constitute Human Rights Commission in the States which are not having the Commission at present. He also suggested that a Special Human Rights Court should be set up in each district to address the human rights issues. He also said that it is time that Parliament revisited the Protection of Human Rights Act, 1993 to make it more effective empowering the Human Rights Commissions in a manner that, if not all, to begin with, at least some of their recommendations are binding for the Governments. 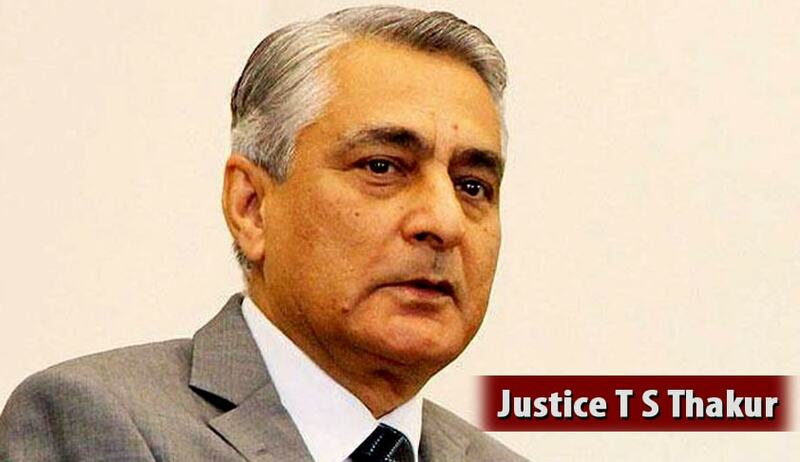 Referring to non-compliance of more than 600 recommendations of the National Human Rights Commission (NHRC), Justice Thakur said that when a recommendation for a relief is made by a body like NHRC, having a former Chief Justice of India as its Chairperson, former Judge of Supreme Court and a former Chief Justice of High Court as its Members and two other Members of eminence, the least the Governments must do is to give a reasonable answer why the recommendations by the NHRC cannot be implemented. Justice Thakur was reacting to the NHRC Acting Chairperson, Mr. Justice Cyriac Joseph's observation that recommendations of the NHRC in 679 cases were not implemented by the different Governments and that many termed it to be a toothless or paper tiger. He said the judiciary was not lagging behind in enforcing human rights and cited a number of cases wherein its interventions not only brought relief to the victims of human rights violations but also issues like clean environment and drinking water as enforceable rights within the ambit of Right to Life. He said that some of the human rights should be placed a pedestal higher than the constitutional rights. Observing that there were a number of deficiencies in the Protection of Human Rights Act, 1993, Justice Thakur said that these needed to be looked into. He pointed out that Protection of Human Rights Act, 1993 has given the Governments mandate to set up Human Rights Courts but in order to make them functionally effective, the need is to identify some definite class of cases pertaining to offences against women, children and vulnerable sections of the society which can be heard by these Courts on a fast track basis. Justice Thakur wondered why a city like Delhi should not have a Human Rights Commission. He said and said that the Supreme Court has given six months' time in July, 2015 to the Delhi Government to set up a Human Rights Commission and the response is awaited. Justice Thakur lauded the role being played by the National Human Rights Commission towards protection and promotion of human rights. This year, the Human Rights day is devoted to the launch of a year-long campaign marking the 50th Anniversary of the two International Covenants on Human Rights: The International Covenant on Economic, Social and Cultural Rights and the International Covenant on Civil and Political Rights. These Covenants were adopted by the United Nations’ General Assembly on the 16th December, 1966. The slogan for this year’s Human Rights day is – ‘Our Rights..Our Freedoms…Always’ that aims to promote and raise awareness about these covenants. Addressing on the occasion, the Minister of State for Home Affairs, Shri Kiren Rijiju said that a dignified human life is the core aspiration of every human being. The State must secure that basic human right of every individual which is related to right to life, liberty, equality with dignity. He also said that International Human Rights Day marks an important milestone in the realization of human rights for all citizens of the world. Shri Rijiju also said that India has been unequivocal in its commitment to the preservation and protection of human rights globally as well as within the country. It is party to several of the core international human rights conventions, including the International Covenant on Civil and Political Rights, 1966 International Covenant on Economic, Social, and Cultural Rights, 1966, Convention on the Elimination of All Forms of Discrimination against Women, 1979, Convention on the Rights of the Child, 1989, and the Conventions on Rights of Persons with Disabilities, 2007. The MoS Home also said that the National Human Rights Commission has developed a wide range of innovative mechanisms, including its Camp Sittings, Open Hearings and the Commission’s flagship 28-district programme, whereby the Commission gets a first-hand account of the ground reality and also works closely with district and state authorities towards an improvement of basic services to the people and more effective implementation of the governments’ socio-economic programmes, legislations etc. The Minister said that, to address the various challenges that confront our society, Parliamentarians will have to ensure adherence to human rights standards in all activities, programmes and policies of the government of the day. They have a particularly crucial role to play in ensuring that in all domestic legislation (proposed or existing), a human rights perspective is incorporated, so that no legislation ends up working at cross purposes with the country’s commitment to protect and promote the rights of the citizens.